Who doesn’t love the Hawaiian Islands? I mean, what’s not to love? Gorgeous beaches? Check. Beautiful sunsets? Check. Long, lazy days with nothing more to do than lay in the sun and order fruity cocktails with umbrellas in them? Check. So, I did the next best thing…if we can’t go to Hawaii, I can bring the taste of Hawaii to us. I started brainstorming dishes to make using coconut oil, which would be inspired by all the lovely, tropical flavors of the islands. With these dishes and the smell of coconut oil in mind, I went into the kitchen to create a new version of shrimp cakes for Andy. I haven’t made them for a long time, and he requests them frequently…they are one of his favorite appetizers. I wanted this version to have an unmistakable Hawaiian spin with mango, papaya, coconut, and of course, if I’m making anything for Andy, it has to have spice. In a shallow dish, combine remaining 1 cup of panko with coconut flakes. Line a baking sheet with parchment paper. Scoop out scant 1/4 cups of the mixture and form into patties, about 2 1/2 inches across, then dredge in panko-coconut mixture, pressing firmly so it adheres. Place breaded crab cakes on baking sheet and chill in refrigerator for at least 1 hour (or up to 4 hours). Meanwhile, combine all the salsa ingredients and chill until needed. Just prior to frying the shrimp cakes, make the coconut milk sauce. In a large pan, heat 1 tablespoon coconut oil. Sauté onions and bell peppers until soft. Add coconut milk, rum, Sriracha, ginger and garlic. Whisk to combine. Bring the sauce to a simmer and reduce until thickened, about 10 minutes. Reserve on stove. When ready to serve, heat 1-2 tablespoons coconut oil in a large pan over high heat. When the pan is very hot, add the shrimp cakes (do this in several batches, adding more oil as needed). Fry the shrimp cakes about 2 minutes per side, until browned and cooked through. Drain on paper towels. 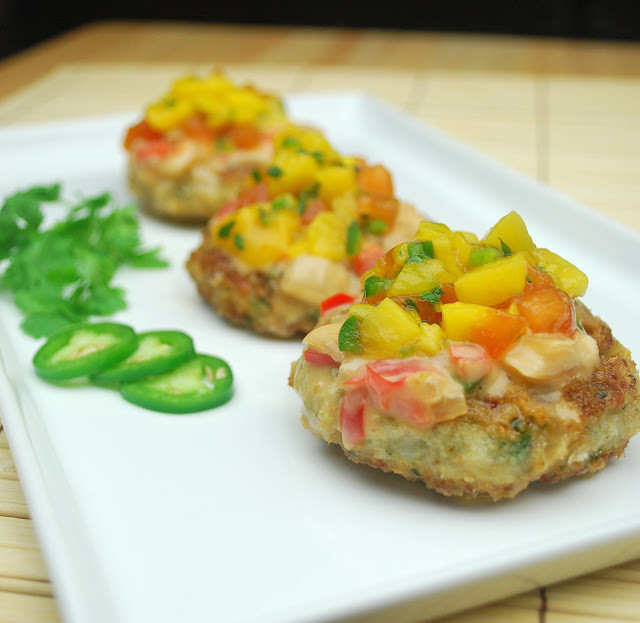 Serve shrimp cakes with sauce and salsa. If the speed in which Andy consumed these is any indication, these shrimp cakes are a winner. The fruit salsa mellows out the spicy coconut sauce perfectly, and the cakes are crisp outside but moist inside. You taste coconut throughout, but it doesn’t smack you in the face…it provides the perfect background flavors for this Hawaiian-inspired treat. Does all this talk of Hawaii and coconut oil have you itching to try some island dishes yourself? You’re in luck…the kind folks at Tropical Traditions want to give you a 32 ounce jar of Gold Label Virgin Coconut Oil! (Must have a US or Canada shipping address.) Giveaway will be open until Sunday, August 28 at 10:00pm PST. Aww your post is making me homesick for Hawaii! THis is a great dish! I love the coconut sauce you have the shrimp and crab cakes sitting on- I want to lick that off the plate! WOW! Those look so fresh and delicious. The photos are amazing. I would LOVE to win the coconut oil as it gives such a great additional layer of flavor to dishes. This looks fantastic! I have a coconut-scented shampoo that always reminds me of vacation! I have never been to Hawaii, but I would love to go someday. I would have to bring a vat of sunscreen, I burn so easily! These look so delicious, I would love to try them!! 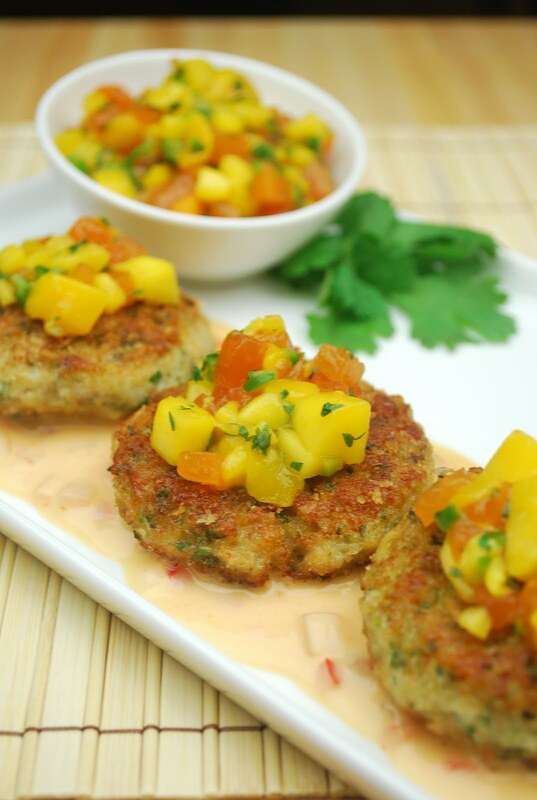 Mango-Papaya Salsa and Spicy Coconut Milk Sauce. Awesomeness for ALL of the above. That sounds so yummy! Awesome and generous giveaway too :) Tweeted and Buzzed! These look delicious!! Your photos are amazing, the colors are nice and bright. Yum!! Your photographs have my mouth watering! I am saving this recipe, it looks and sounds absolutely wonderful. Yum! I have never been to Hawaii, but I am sure this would make me feel like I have! Great pictures! Count me in as one who hasn't been to Hawaii either, but I'm willing to let these stand in for a visit (for a while). They're gorgeous and look delicious. I've never been to Hawaii... maybe someday. Love the crab cakes. These pictures are amazing! I'm a photography blogger and currently in love with food photography and I was so excited to see these images of the yummy crab cakes. Great captures. Look delish. The colors are amazing! I follow @TropTraditions on Twitter. I like Tropical Traditions on Facebook. Have never cooked with coconut oil. i would love to try it! Follow Coconut traditions on Twitter. I absolutely love coconut oil. It is a great addition to gluten free desserts made with coconut flour too. Those pictures look SO yummy! I've never tried this recipe...but, looks like I should! These look terrific... I just love the whole thing, including the salsa! I am wondering... does this need to be fresh crab, can I get away with the canned stuff??? I absolutely LOVE your wedding photos up there... so gorgeous!! beautiful post...great recipe...would love to try that coconut oil!!! Beautiful pictures and recipe Karen! Arg! I always feel like I am "behind" on the comments! I can smell the tropics from here! We were lucky enough to have Karen make the shrimp & crab cakes for us. They are coco-licious! I love coconut oil. Everyday I learn a new way to use it. 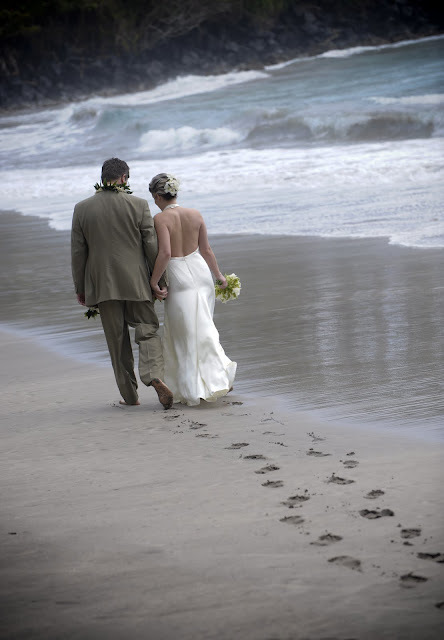 You were married in Hawaii? Beautiful!! 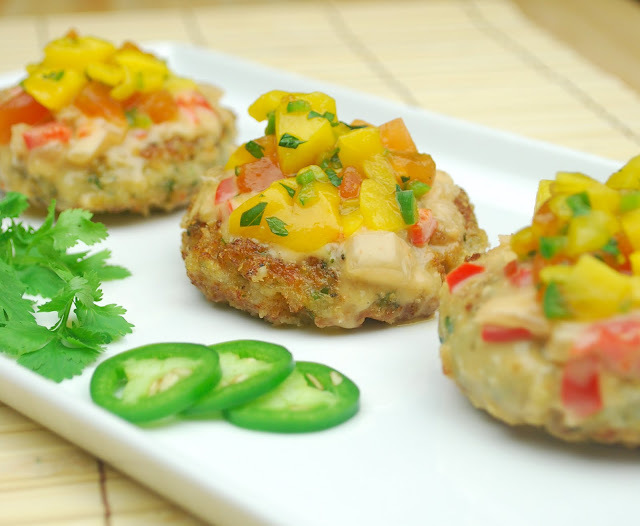 Pretty crabcakes! Married in Hawaii?!?! Lucky!